The Youth Forum was held as a side event to the biennial Commonwealth Heads of Government Meeting (CHOGM), which has been marked by international controversy. While the headline allegations of human rights abuses by the Sri Lankan government during and after the 30-year civil war are known, many abuses are alleged to be continuing, even during the CHOGM summit in the presence of fifty world leaders and The Commonwealth Secretariat. The 9th Commonwealth Youth Forum (CYF) aimed to provide a forum for youth leaders to exchange ideas, discuss and draft policy priorities, and elect their newly inaugurated Commonwealth Youth Council (CYC) – the largest youth representative body in the world, covering 53 states and 1.2 billion young people. Watch our film on the Commonwealth Youth Council here. Protest throughout Colombo was prevented during the CHOGM Summit through a court order obtained by police on November 14th. This comes days after university students in Colombo took to the streets to protest against the government’s decision to close their universities for the period of the summit, which the government had claimed was at the students’ request. Students were also asked to leave their dormitories for “repairs”. Is this the value set the international youth movement wishes to be part of? With the country in the limelight, the Commonwealth Summit was seen as an opportunity for Sri Lanka to showcase its post-war revival and attempt to amend its reputation. The 9th Commonwealth Youth Forum was no exception to this. 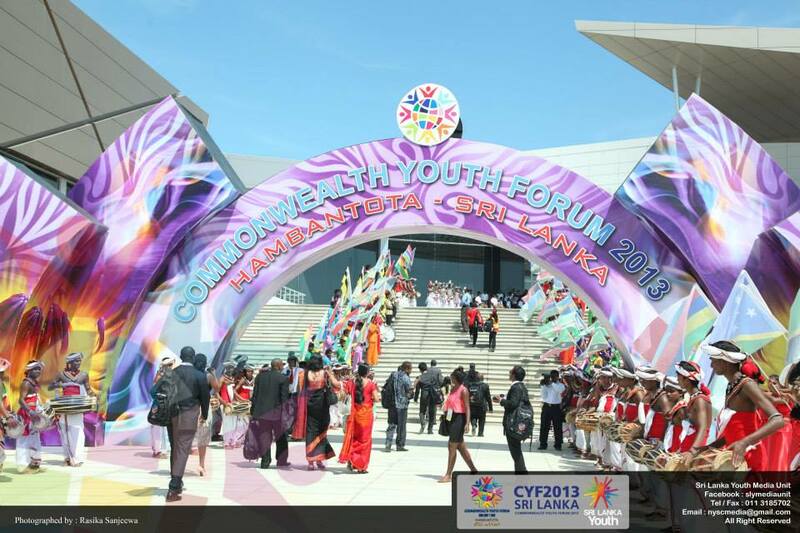 The Sri Lankan government went to considerable lengths and expense to welcome the Commonwealth youth delegates with elaborate open and closing ceremonies, a brand new convention centre, glossy pamphlets and generous gift bags – all in the name of investing in youth, and encouraging participation. 15 Heads of Government attended the closing ceremony at the newly opened Magam Ruhunupura International Convention Centre, which cost $15.3 million USD. The new convention centre is complimented by a new airport and port, in an area historically linked to radical student protests and now an area of controversial regeneration following destruction after the Asian Tsunami of 2004. This year’s Forum was unique as it inaugurated the first-ever Commonwealth Youth Council (CYC) – an elected youth decision-making body that will represent and advocate for youth within the Commonwealth. You can watch our short film on the CYC here. Following the unanimous passing of the CYC Constitution (after a 24 hour delay), delegates moved to the creation, debate and voting of the Forum Declaration (pdf) which outlines the policies of the CYC. The declaration was presented to Heads of Government at the special Youth Dialogue event on Friday 15th November which resulted in the Pakistan government offering $100,000 to the Council. Previous communiqués are also available here. This year’s theme was “Inclusive Development: Stronger Together”. Young delegates developed policy positions in the following areas: Youth in the Post-2015 Agenda, Generating Quality Youth Employment, Sexual and Reproductive Health and Rights, Education, Well-being and Growth, Reconciliation and Social Cohesion, Gender Equality, and Professionalising Youth Work. Each of the eight topics had expert-led panel discussions intended to give a background to the topic, which were then followed by a working group session, where delegates would discuss and draft the policy statements. Participants that we spoke to said that they felt like they were being lectured to in the panel discussions, with very little interaction or opportunity for participation. For a bulk of the work – which would be done in working group sessions – delegates were only given four hours (2 hours per topic) throughout the entire five-day Forum. Even when participants were in workshops, little attention was given to the representativeness of sessions. Out of the nine people who drafted the post-2015 policy statements and the six who drafted the professionalisation of youth work motions, only one was an official youth delegate in each session. The others were observers, workshop facilitators, volunteers or international guests. While the theme of the forum was participation, the overarching purpose seemed more about showcasing the cultural and touristic aspects of the host country. It felt that two distinct events were taking place: The Commonwealth Youth Forum and a group tour of Sri Lanka’s south coast. Indeed many delegates lined up to remind the Sri Lankan General Assembly President of their main reasons for being at the Forum. It was remarkable that such a reminder was required given that this is the 9th Forum held under the Commonwealth banner. The General Assembly resolved to resume voting after a shortened tourism trip and cultural performance, extending the voting until 2:30 am and then completing the remaining votes the following morning. The organising volunteers and the Youth-led Task Force should feel proud of their contribution – not only about resisting cultural programme elements to overpower political programme components, but also in asserting (if only modest) influence over the content of the agenda. Despite the claim of the event being ‘youth-led’, it would be unfair to lay critiques at their door given the little control of events we believe they have had. Similarly, Youth Delegates at this event attempted to represent the young people of their country and their commitment to process and debate was evident. No formal evaluation was conducted by the organisers at the end of the event, though some delegates (who were often funded by their national governments to attend) mentioned to us on the condition of anonymity that they felt unable to speak out and criticise the event or its hosts. Cultural spectacle vs youth concerns? The constant doubt whether the Forum had been organised for the spectacle or for the many pressing issues young people in the Commonwealth face wasn’t helped by continuous referrals to the mysterious ‘Sri Lankans’ as those in charge. Indeed, responsibility for the Forum programme continues to be unclear: the Commonwealth Youth Programme and Commonwealth Youth Exchange Council supported the International Youth-led Task Force, which then worked alongside the Sri Lankan National Youth Services Council and government representatives. The absence of clear responsibilities has resulted in an absence of accountability. 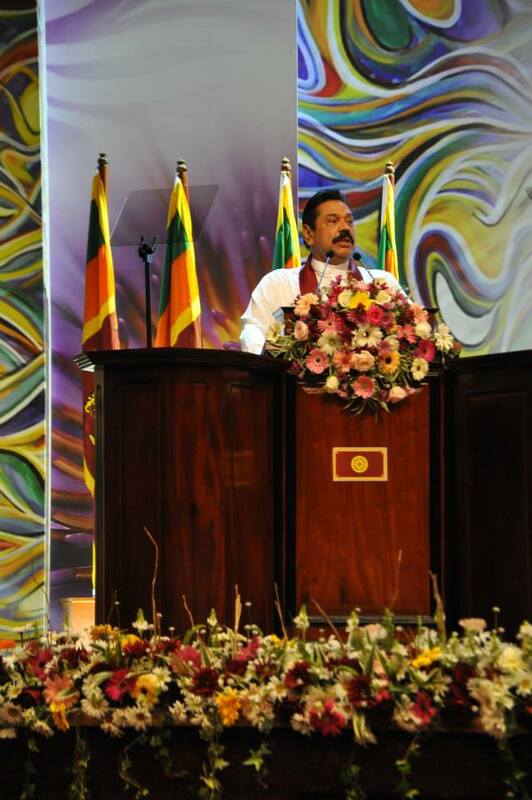 The Sri Lankan Government has claimed a space within the international youth sector. 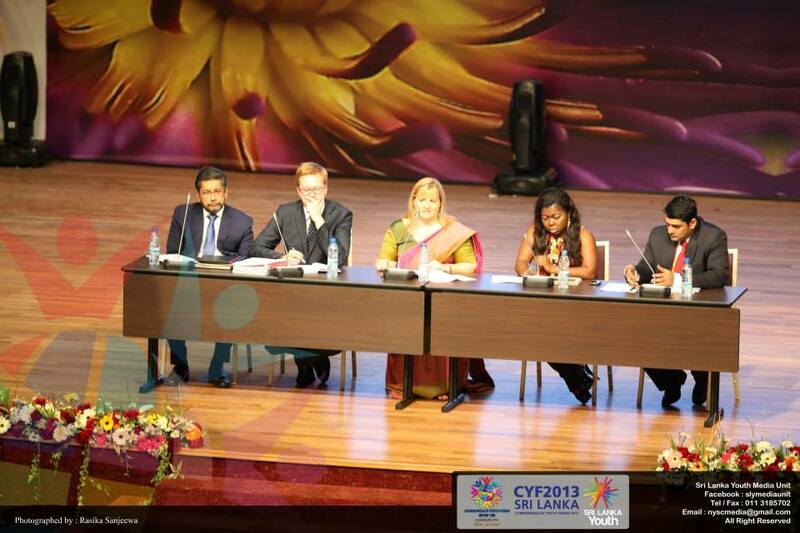 As hosts of the Commonwealth Youth Council this 2013, it prepares to host yet another international youth summit – the World Youth Conference in May 2014. It also made a $30,000 donation to The Office of the UN Secretary General’s Envoy on Youth in 2012 and has offered to host the secretariat of the newly inaugurated Commonwealth Youth Council. While the international community routinely chooses to accept offers by governments with poor human rights records and allegedly disputable intentions (one of the most recent, and blatant, examples being the Internet Governance Forum that was hosted by Azerbaijan in 2012), both with the hope of increasing peer pressure and strengthening opposition movements, it is uncommon for one government to host the two biggest thematic events in any given policy domain subsequently. Given the alleged historic and current human rights abuses and the treatment of youth and students currently, the international youth sector must carefully consider the financial incentives of this supposedly youth-supporting government. If the motivation of Sri Lanka’s government were truly the participation of young people, would they have suppressed protest and removed students? Is this the right place to host the next World Youth Conference?